Mixologists are becoming magicians. 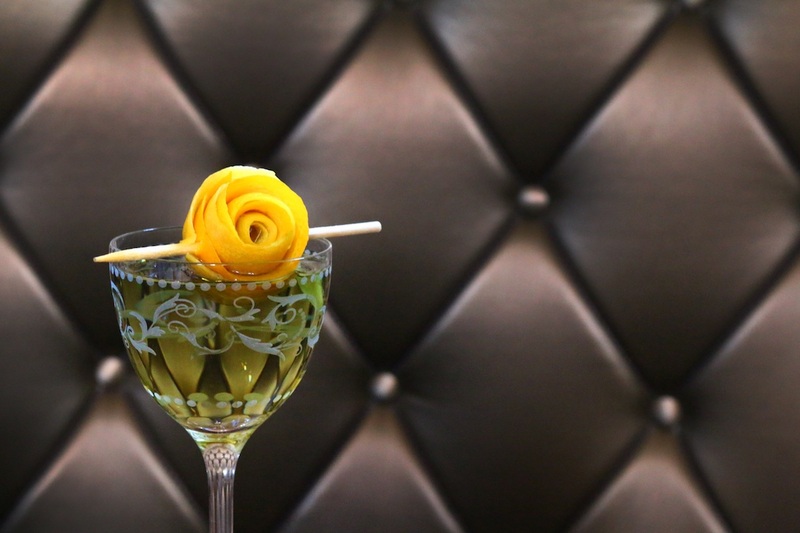 Top cocktail creators have figured out whimsical ways to turn their tipples into tricks that leave their guests clapping with delight. One of their favorite illusions is to transform their drinks from one color to another. Here are five color-changing cocktails to add magical vibes to any #ThirstyThursday. Just as Anastasia undergoes a stunning transformation in 50 Shades of Grey, so does this sultry sipper. The 50 Shades of Jade is a shaken mixture of shōchū, sake, crème de violette, and Gran Classico. It’s cloudy when it’s first poured into the coupe glass, but then it takes on a golden glow before ultimately settling on a purplish-green hue. Make a reservation at Arbella. True Bleau, baby, we love you. 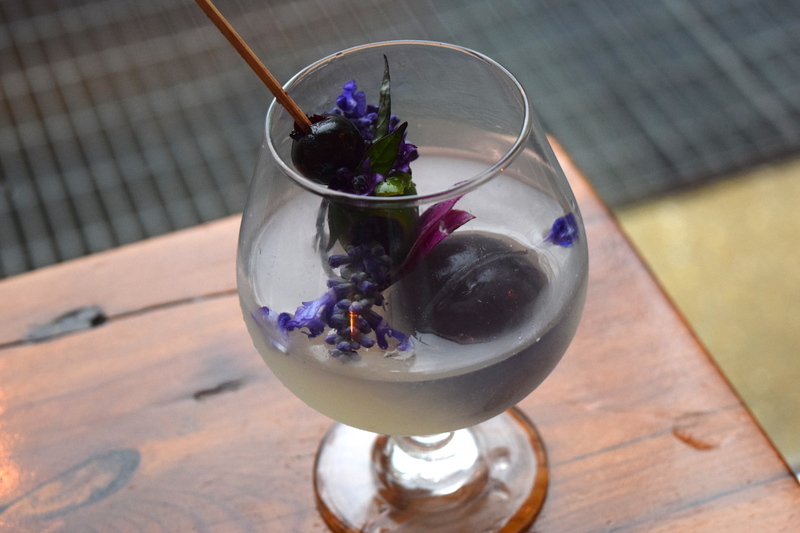 Featuring gin and grapefruit soda, the cocktail is completed with a pea flower-infused ice cube. 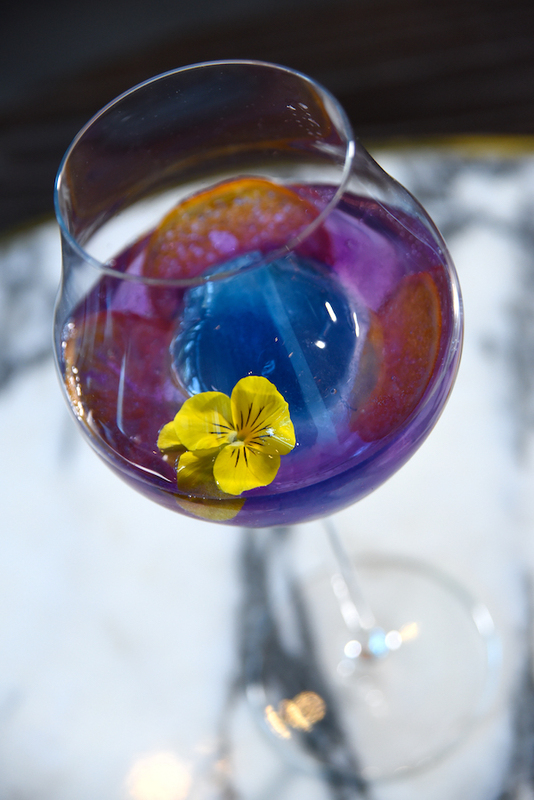 As the cerulean sphere melts, the cocktail turns a rich violet color. Make a reservation at Scarpetta. Sitting in the middle of a bitter gin martini is a scoop of Ponchatoula strawberry granita. As the scoop of slush melts, it gives the drink a ruddy hue. Additionally, the berry-powered slurry adds a subtle sweetness, which balances out the cocktail. Make a reservation at Toups South. The Transformation is actually two drinks in a single glass. There’s a gimlet forged from gin and basil-lime cordial and there’s an Aviation cocktail in ice cube form. As the spherical ice melts, it turns the green gimlet into a purple Aviation. Make a reservation at Firefly. When most people think of dining destinations, the usual suspects always make the short list: Paris, Northern Italy, America’s Pacific Northwest, and so on. But foodies in the know waste no time getting to the Canadian province of Alberta. Here, a wilder version of Canada shares space with modern cities. The resulting hospitality is decidedly unpretentious and rooted in a history of agriculture. To understand the ethos of Alberta’s magical gastronomy is to understand the vastness of this sportsman’s haven. Some of the earliest settlers in the region were ranchers and, still today, acres and acres of beautiful farmland and luxury in unexpected places abound, with the Canadian Rockies rising up behind them. At nearly 700,000 square miles, there are five UNESCO World Heritage Sites including famed Banff & Jasper National Parks and Waterton-Glacier International Peace Park. To further put it in perspective, while immense, Alberta is just the fourth largest province in Canada and home to forest, prairies and mountain ecosystems. A shorter growing season means a higher appreciation for fresh veggies. Alberta chefs have more respect for ingredients than most, in platefuls of practiced discipline and creativity. Calgary and Edmonton, the province’s two largest cities, are at the top of the heap in Alberta’s legion of fine dining. Yet some of Alberta’s best eats are nowhere near bustling locales. The agony of a visit to this slice of present-day Canada is having but just three meals a day. The thrill is knowing everything put in front of you will be sublime. Here are a few places to start exploring, whether you’re a local or a traveller. In one of Canada’s most Instagram-worthy destinations, visitors flock to Lake Louise for events throughout the year and the many choices to dine against the spellbinding backdrop of the Victoria Glacier. The Chateau itself is majesty, built in Alberta’s Banff National Park. Between meals, visitors indulge in guided mountain tours, some of the world’s best skiing, and hiking among other activities at the more than 100-year-old property. Alpine Social is the place to be for après ski, a classic mountain hangout that invites patrons to indulge in the massive Scrabble wall and other games. The resort’s most jovial gathering hole, it has a Canadian-themed menu replete with bison and elk burgers. Regulars delight in being able to fellowship in a casual place within one of the fanciest places in the Province. Make a reservation at Alpine Social at The Fairmont Chateau. 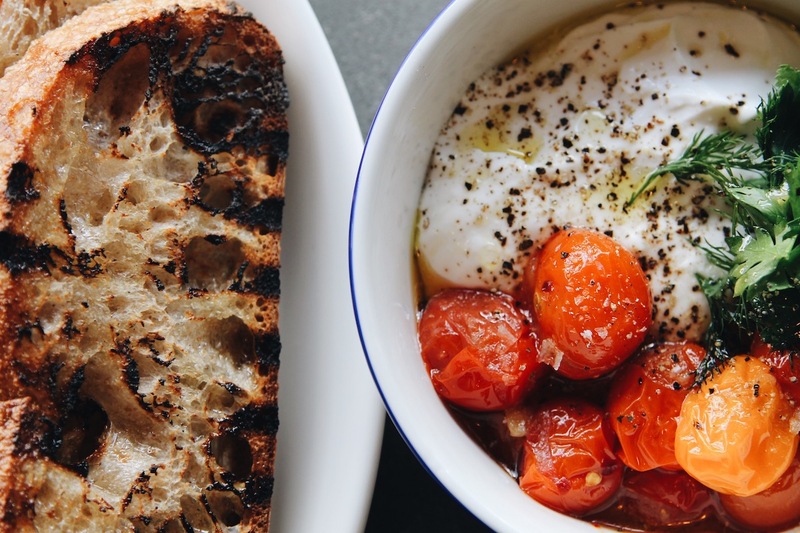 When a restaurant can make something as simple as tomatoes and feta seem like a revelation, it’s a winner. But the best description of Ten Foot Henry comes from one of its biggest fans. Travel Alberta’s Kristyn Snell is a regular. She likes to say that dining at Ten Foot Henry feels like sitting in a terrarium. Between the tall windows and plants, this bright and shiny eatery boasts a mostly vegetarian menu, perfect for taking a mini-vacation from all the wonderful meat dishes throughout Alberta. 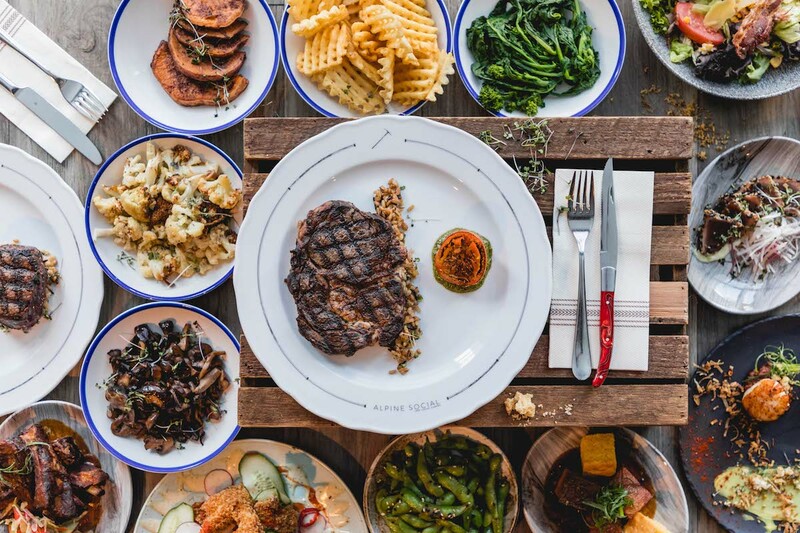 Ten Foot Henry does have three meat dishes and a charming front-of-the-house café called Little Henry where guests can indulge in coffees and desserts. Snell credits the butterscotch pudding for taking her back to her childhood every time. Make a reservation at Ten Foot Henry. 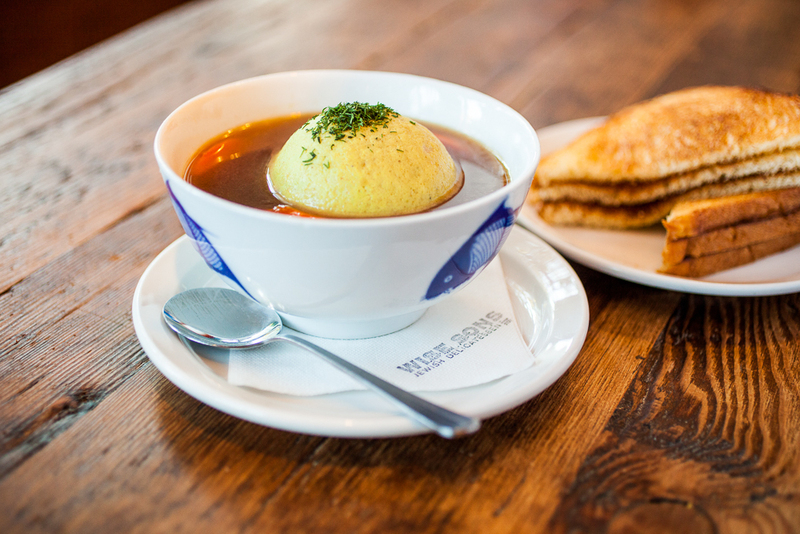 Two Penny is like the headquarters of food happiness in Calgary. No wonder diners are all smiles here, what with steamed char siu pork barbecue buns and duck and foie gras potstickers with plum and black vinegar gastrique, just for starters. 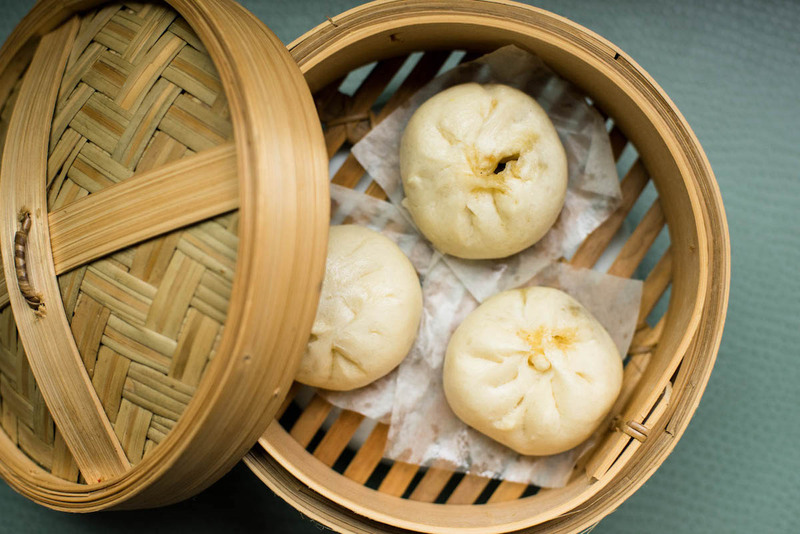 Save room to share a few of the chef specialties, like a garnish of onion jam and pickled apple with crispy skin pork belly, or Oolong tea-smoked half duck – served with milk buns, hoisin sauce, and pickles. For beef lovers, the Wagyu brisket Shanghai noodles pop with flavorful scallions, carrots, cabbage, shiitake mushrooms, and bean sprouts. The big surprise here is the craft cocktail program, both inventive and alluring with drinks like the ginger soy sour with gin, ginger, burnt soy, and chili threads, or the “3 Years in the Making” mixed with whisky, rye, plum wine, rice vinegar, bitters, and sesame mist. Make a reservation at Two Penny Chinese. Canadian Rocky Mountain Resorts’ dizzying array of dining choices at Buffalo Mountain Lodge, Deer Lodge, and Emerald Lake Lodge may feel daunting, but all are well worth contemplation. Fans credit the meats from the company’s own free-range elk, bison, and caribou farm for their rave reviews, along with housemade preserves. It’s one of Banff’s most beloved hotels, secluded and cloaked in the beauty of this remote region. Make a reservation at Sleeping Buffalo Restaurant & Lounge. Picture yourself in 1910. You’re miles from anywhere in the Union Bank of Canada building, surrounded by the quiet, cool security of the stout structure. That same historic vibe remains in what’s now a boutique hotel in Edmonton – but these days it’s defined by Madison’s Grill and things like lobster truffle fettuccini, scallops, and lamb shank. 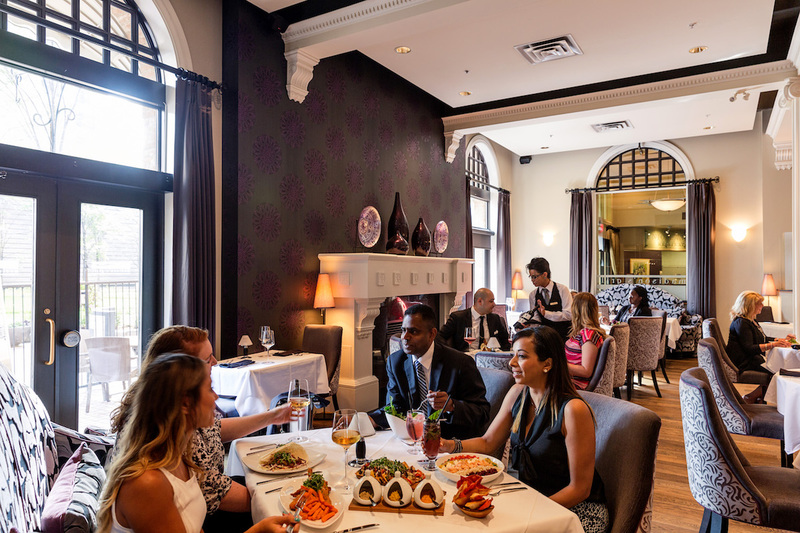 The creative team at Madison’s have mastered combining typical ingredients in atypical ways – take the chevre-stuffed pork loin, stuffed chicken forestiere wrapped in prosciutto and served with creamed leeks, or red wine-braised rabbit with confit fingerling potato Lyonnaise. Make a reservation at Madison’s Grill. 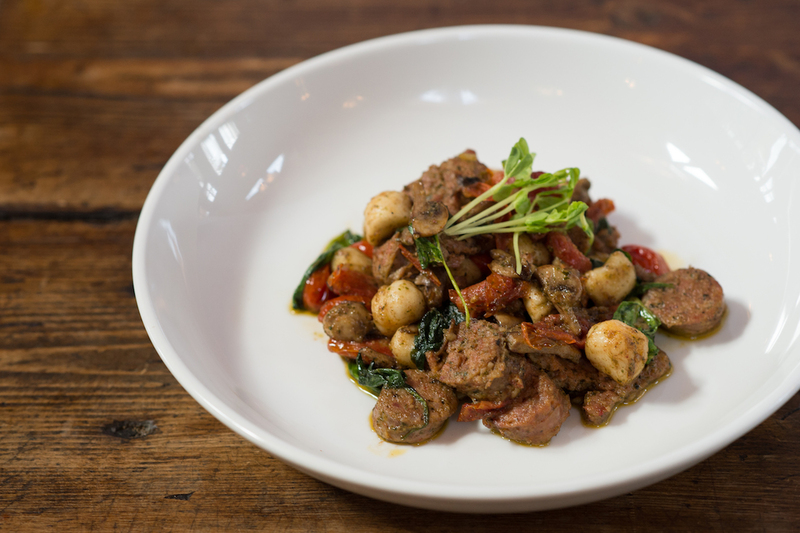 The humble meatball is found in many cultures, from Italian and Greek to Danish and Swedish. In the states, there’s even a National Meatball Day. 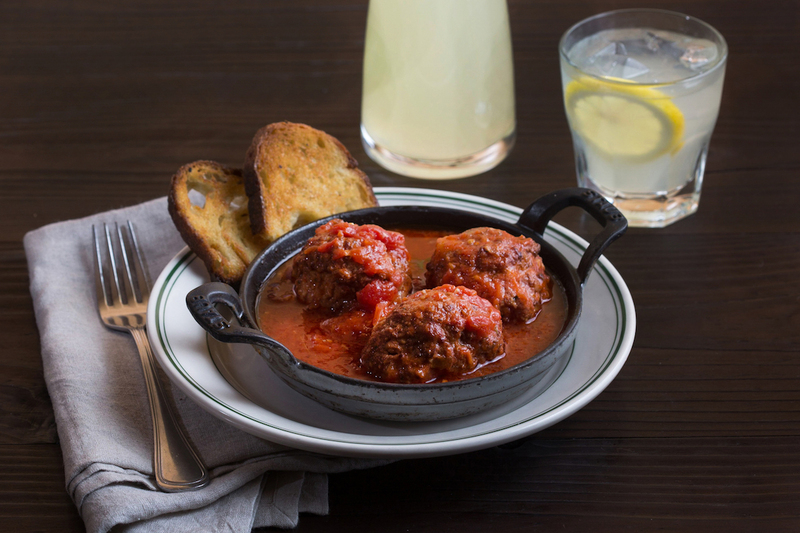 Here are 14 restaurants for meatball lovers to try some of the best versions. 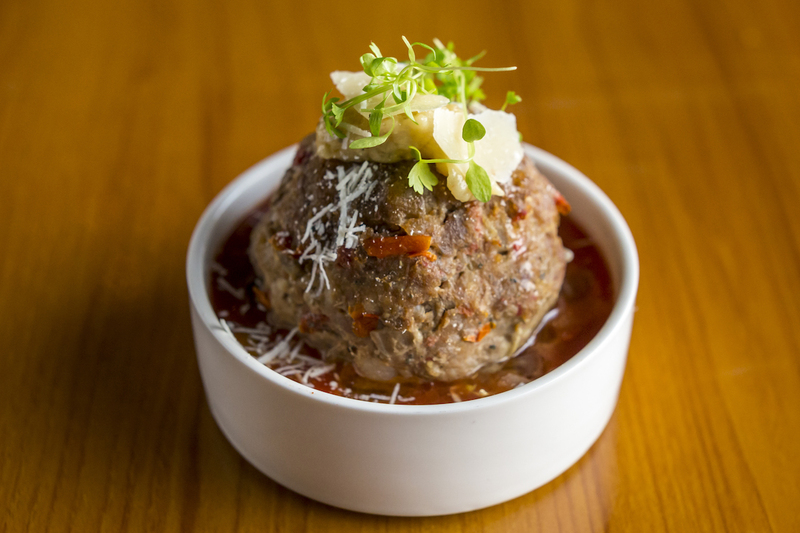 The Wagyu beef meatball was created by owner and Top Chef alum Fabio Viviani. 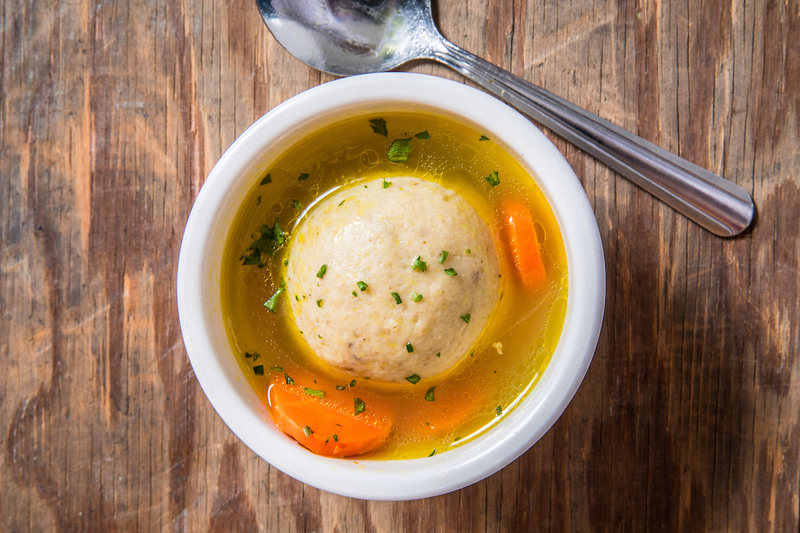 You’ll get one — and, at 12 ounces, it’s the size of a softball. In fact, its presence is so large, it has its own Twitter account @sienameatball. It’s served in roasted tomato sauce with a dollop of ricotta on top and a shaved basil finish. Make a reservation at Siena Tavern. 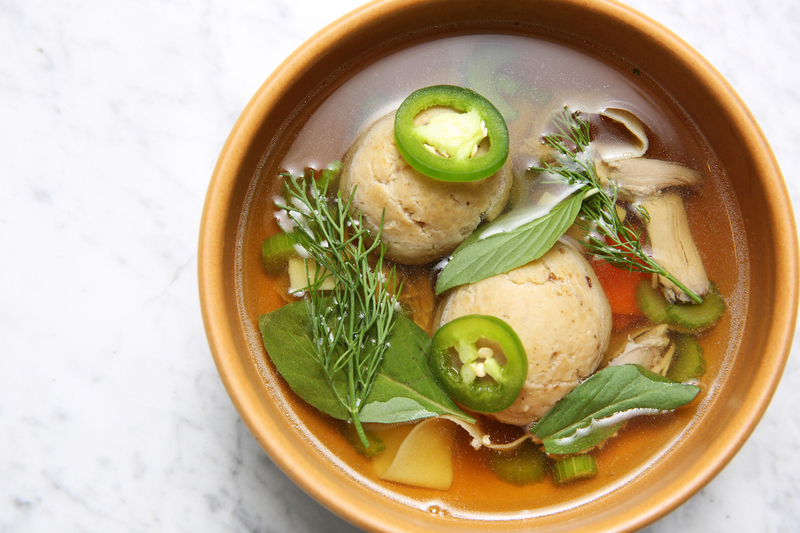 Vegetarians rejoice — you, too, can love a meatball. The eggplant “meatball” served here is a bite of panko-crusted eggplant served with homemade marinara sauce and topped with fresh basil and Parmesan cheese. Make a reservation at Piñon Grill. 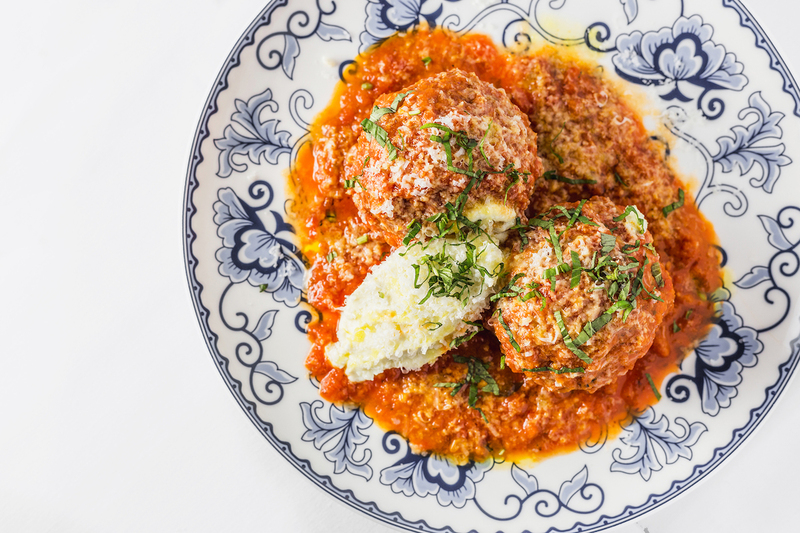 Chef-owner Steve DiFillippo’s mom’s recipe for Kobe beef meatballs with Caciocavallo is a two-day feat. The secret: soak the breadcrumbs in milk first before mixing them with the other ingredients for a tender, juicy meatball. Order them from the antipasti menu as a starter to share or make a sandwich with the signature Asiago cheese popovers. Make a reservation at Davio’s. 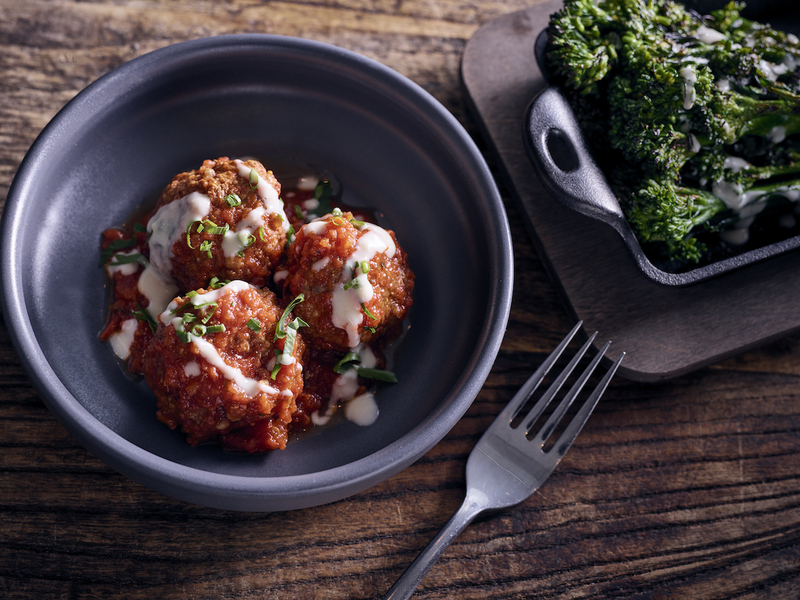 Culinary director and chef Joe Farina puts a local Midwest spin on the classic Italian treat with his Mama’s Meatballs dish. His secret: premium cuts of veal and beef, imported Parmigiano-Reggiano cheese, and a special blend of Italian seasonings — along with inspiration from the supper traditions he grew up with in Melrose Park, one of Chicago’s oldest Italian ‘hoods. Make a reservation at Armand’s Victory Tap. 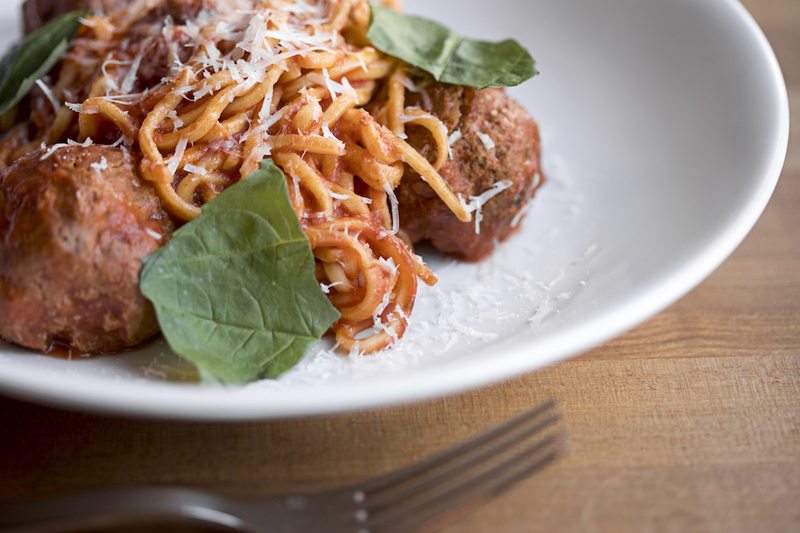 From the kitchen of executive chef Jason Stern comes award-winning meatballs. His recipe: beef, pork, tomato, and basil, served on a bed of creamy polenta and topped with Pecorino Romano. Pasta lovers can go for Colletta’s Spaghetti and Meatballs for a taste of his talk-of-the-town meatballs. Make a reservation at Colletta. Not everybody loves their meatballs made with red meat, of course, and, thankfully, poultry makes a tender meatball, too. 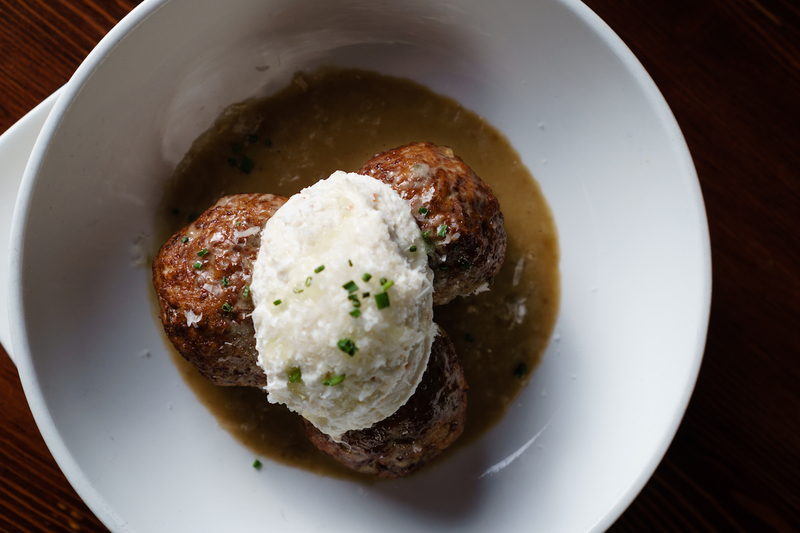 The balls here are rounded with braised chicken along with a pop of flavor from whipped sheep’s milk ricotta and a wild mushroom cream sauce. Make a reservation at Beauty & Essex. 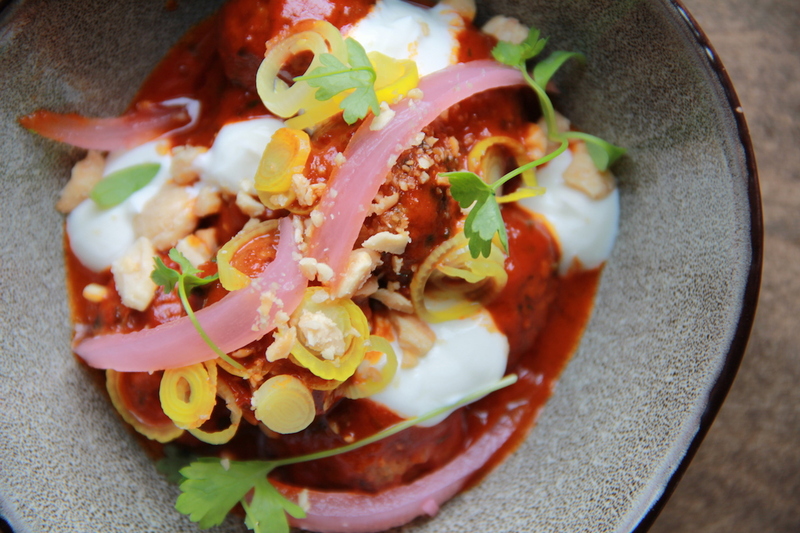 The popular Catalan-style tapas spot serves executive chef Diego Amat’s bite-sized, smoky Albondigas — beef and lamb orbs with smoked yogurt, pickled vegetables, mushroom, harissa, and Marcona almonds. 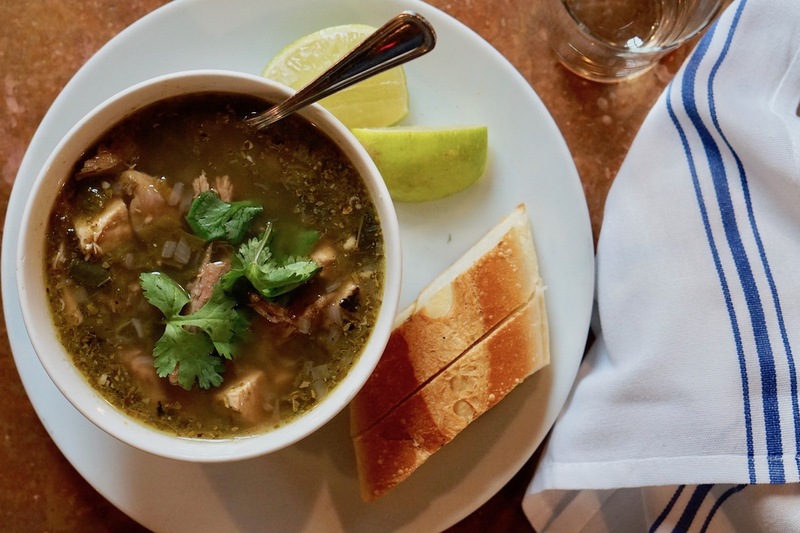 Make a reservation at Mercat a la Planxa. 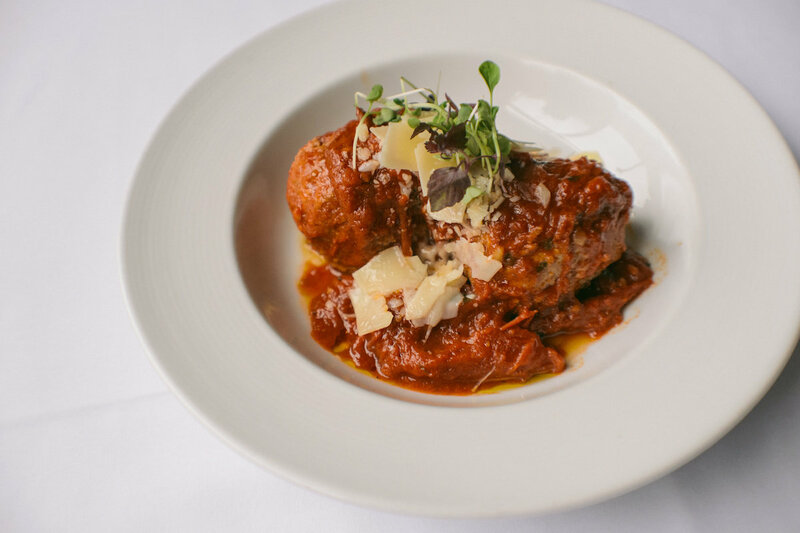 The folks at the Castellucci Hospitality Group’s flagship restaurant knows a thing or two about meatballs. 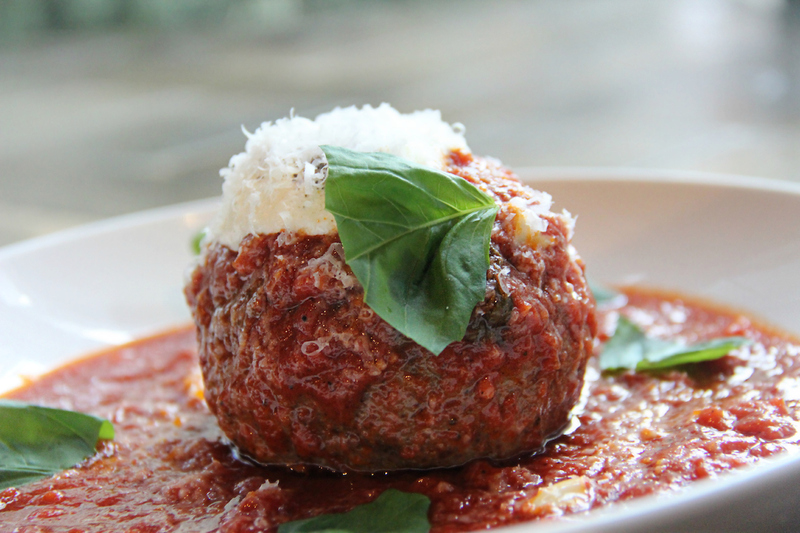 The family recipe speaks to traditional Italian meatball methods — with a touch of Greek. 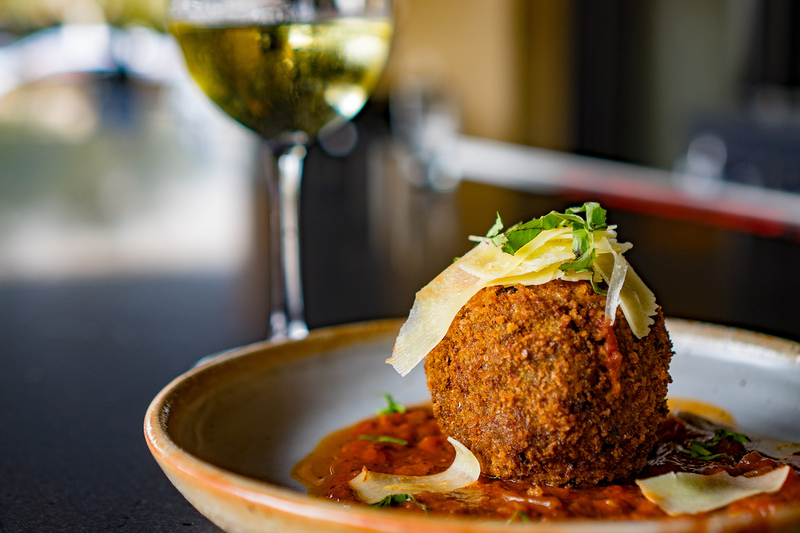 The meatball is crafted with a combo of roasted tomatoes, caramelized onions, dates, tomato basil sauce, and Pecorino. Make a reservation at Sugo Kitchen. 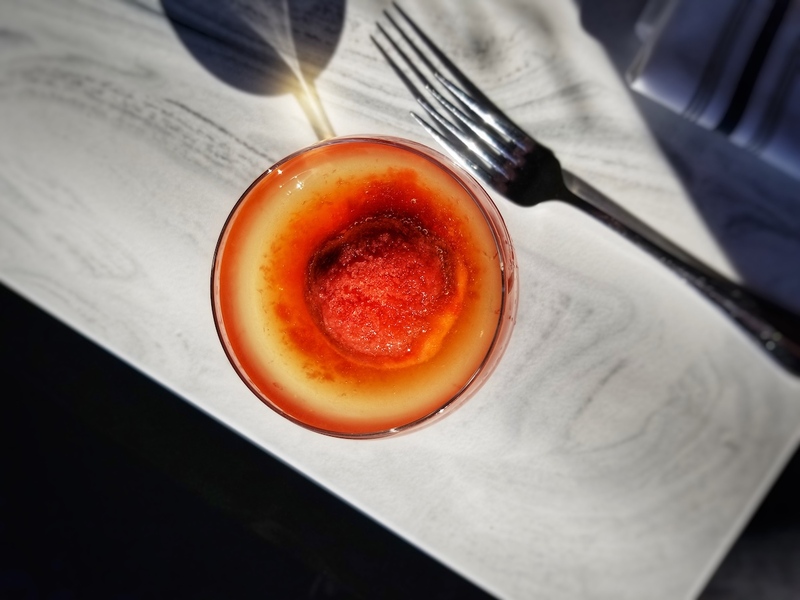 Chef Craig Stoll’s Neopolitan Meatballs in Sugo are a special recipe, created with love — and pork, beef, and veal in a tomato sauce, finished in hot oven, crowned with shaved Parmigiano, and served with crostini. Served at all four locations. Make a reservation at Pizzeria Delfina. Chef Hoffman’s Polpette E Mash Potato dish stars lamb and pork meatballs, fresh mozz, and a creamy potato and tomato sauce. 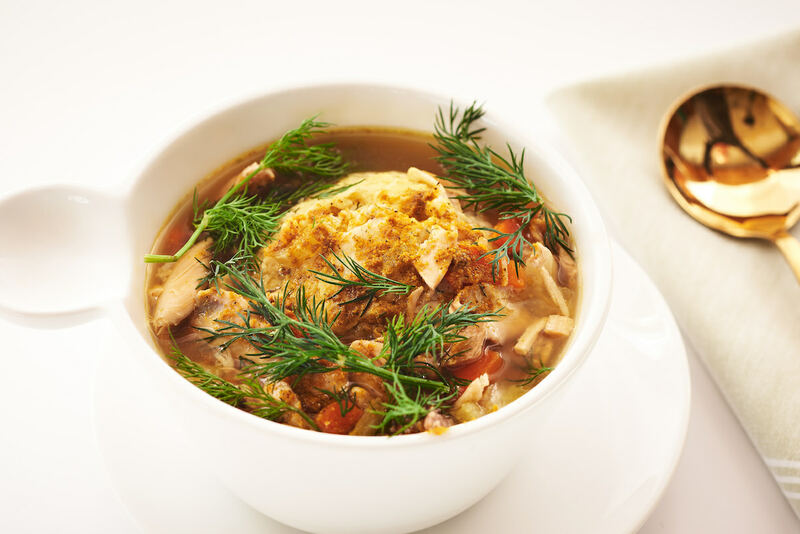 He makes a panade with leftover housemade bread like ciabatta and focaccia to bind the meatballs and add flavor, then browns and braises them in Pomodoro and smoked ham hock until soft. Served with Taleggio and truffle fonduta. Make a reservation at Angeline’s. Caroline Potter is the Chief Dining Officer for OpenTable, Inc. She’s a dining trend-spotter and an OpenTable VIP, who dines out more than she eats in and has accrued more than 10,000 Dining Rewards points. Caroline started working in restaurants as a teen and she’s since tackled every front-of-the-house job, from bartender and hostess to runner and server. She trained as a chef at Manhattan’s prestigious French Culinary Institute, cooking at L’Ecole. In addition to her role at OpenTable, she has written about food from farm to table for New York City’s famed Greenmarket and Edible Brooklyn and Edible East End magazines. Caroline is also a Certified Master Gardener.